Welcome to Bike the Rabbit! We are a locally owned and operated business that provides high quality bicycles to visitors of Greenville and also residents who want to experience Greenville’s newest attraction, The Swamp Rabbit Trail. 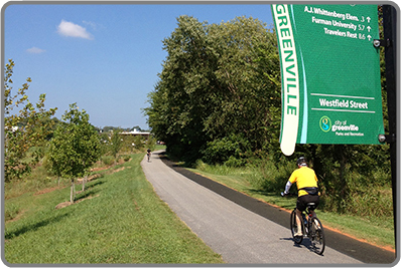 A collaboration of the City of Greenville and the Greenville Health System the Swamp Rabbit Trail is a 17.5 mile paved greenway alongside the Reedy River. With numerous places to pull over and enjoy the scenery the TRAIL is one of the top attractions when exploring Greenville.